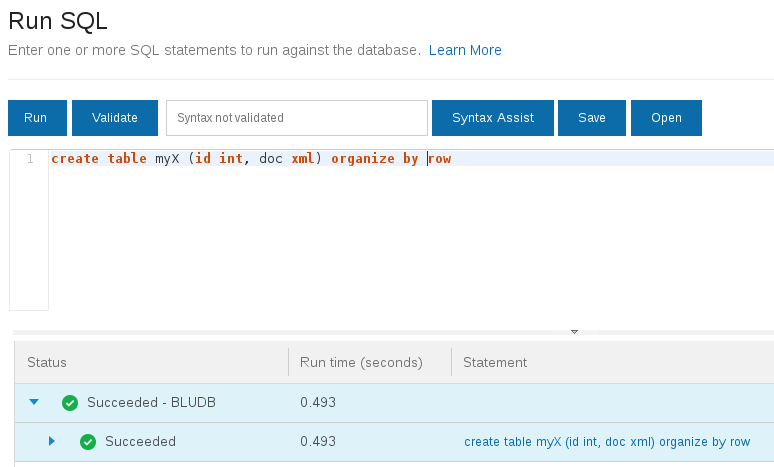 I recently got asked whether it is possible to process XML data with dashDB on IBM Bluemix. The answer to that is that it is possible. dashDB is based on DB2 with its industry-leading pureXML support which I wrote many blog entries about. In the following I give you a quick start into preparing dashDB to store XML data and how to query it. The above statement creates the table "myTable" with two columns, the second of type XML, and in the classic row-oriented table format. Once the table is created, data can be inserted. 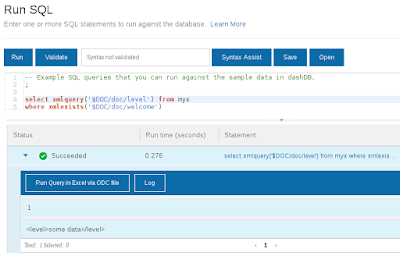 This can be done by using INSERT statements in the "Run SQL" dialog or by connecting other tools to dashDB. The "Load Hub" is designed for analytic data sets and does not support XML-typed columns. 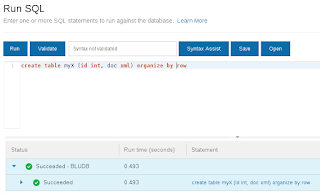 An introduction to inserting XML data can be found in the pureXML tutorial in the DB2 documentation. 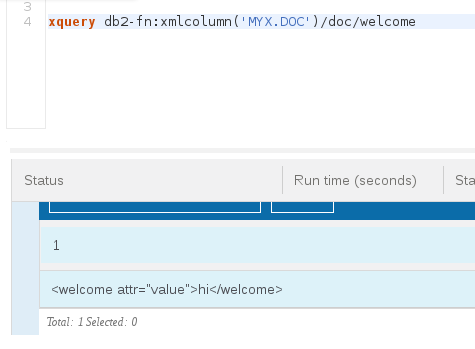 After the XML data is in, the "Run SQL" dialog can be used again to query the documents. Queries can be either in SQL (SQL/XML) or in XQuery, see the screenshots with examples. I hope that gives you a rough idea how to utilize the pureXML feature in dashDB, even though its main focus is analytics.